Spanish bank Banco Santander was halted on Thursday, followed by an announcement it would raise capital. When the bank reopened its shares plummeted as much as 14%, with the Spanish stock market down about 4%. Banco Santander passed the last "stress test" so allegedly it had no need to raise capital. With that thought in mind, let's recap the ECB's love affair with stress tests that seldom find much need to raise capital. On June 22, 2012, I commented Laugh of the Day: Stress Tests Show Spanish Banks Only Need Between €16bn and €62bn in New Capital; ECB to Accept BBB- Rated Debt (One Step Above Junk) as Collateral. In October 2013, after two previous stress tests blew sky high, ECB president Mario Draghi announced that he would not hesitate to fail banks in the third test. In Translating "Draghize", I commented "When it comes to stress tests, especially for European banks, the one thing history suggests is the tests will be essentially stress-free, by design. Why should this time be any different?" On January 16, 2014 I commented ECB Waters Down 2014 Stress Tests Second Time; Yet Another Sham Stress Test. One of the things the ECB watered down was in relation to sovereign bonds. They were assigned a "zero risk". Do Greek bonds look like zero risk here? The second thing the ECB did was make a 25% reduction in the amount of capital banks had to hold. On October 27, 2014 alleged stress tests were a glowing success. The ECB announced Most Banks Are Healthy, failing only 13. Another 12 would have failed but had already taken steps to raise sufficient capital. 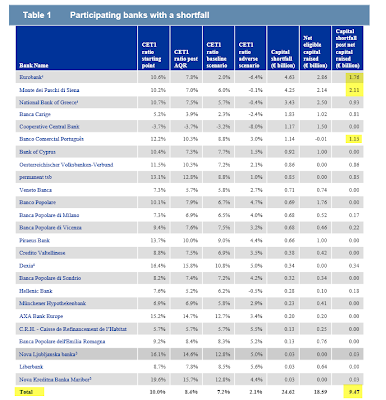 The Wall Street Journal posted a table of Participating Banks With a Shortfall. The list includes all 25 banks. The total capital shortfall of all failing banks was €9.5 billion. The Journal reported "Overall, 25 banks technically failed the so-called stress tests, facing a cumulative shortfall of €24.6 billion. But most have already taken steps to solve their problems since the end of 2013, the cutoff date for the exercise." Please note that the largest shortfall was a 2.11 billion euros. Only three banks had shortfalls over 1 billion euros. Guess what bank was not on the list. Via translation from Libre Mercado, please consider Banco Santander Announces Capital Increase of €7.5 Billion. Banco Santander announced on Thursday it would make a capital increase amounting to €7.5 Billion euros, equivalent to 10% of capital and apply a cut in dividends of 66%. Minutes earlier, the CNMV decided to temporarily suspend trading to avoid unnecessary volatility before the bombshell. The CBMV lifted the suspension on Friday, accompanied with a sharp drop in the stock market. 1,213,592,234 new shares will be issued at a share price of €6.18. New shares will commence trading on the Stock Exchange on January 13. The decision by Chair Ana Botín and CEO José Antonio Alvarez is preceded by a series of events that have taken place in recent months. Last September some discrepancies arose between the ECB and the bank entity with respect to capital levels. Banco Santander thought it was sufficiently capitalized but was pressured to improve its creditworthiness. Following the announcement, rumors flew that Banco Santander would be interested in buying the Italian bank Monte dei Paschi di Siena. Santander will use the funds to expand its business and lending in markets where it already operates and economies are improving, Botin said, adding that Spain’s crisis was at an end. Botin said the bank had no plans to make significant acquisitions because it sees a “huge opportunity internally.” Her emphasis on growing without purchases also marks a shift from her father who spent more than $70 billion on acquisitions after taking on the chairmanship in 1986. The BBC reports Santander Asks Shareholders for 7.5 Billion Euros. Santander is asking shareholders for €7.5bn (£6bn), about 10% of its capital value. Santander comfortably passed a recent bank stress test, but there was speculation about its capital strength and whether it might float its UK arm. Yohan Salleron, an equity manager at France's Mandarine Gestion, told Reuters: "We met Santander one month ago and they didn't say they needed a capital increase. We need to understand why they need (it)." The new game in town appears to be "let the banks pass stress tests in public, fail them in private". 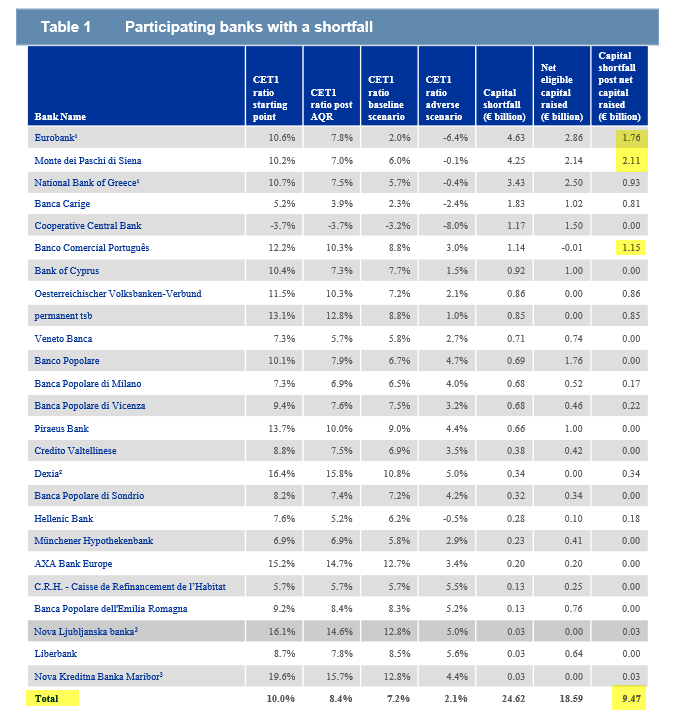 Only 13 banks failed the stress tests to a total tune of €9.5 billion. Curiously the BBC headline reads "Santander Asks Shareholders ...". Is "ask" the right word? Did shareholders have a choice? Santander maintains it was well capitalized yet raised €7.5 billion. Why? For acquisitions? Something here does not pass the smell test. It's difficult to say precisely what, yet one thing's for sure: Banks don't go raising huge amounts of capital for no reason. So what's the reason? Let's return one more time to Botin's statement regarding "no plans to make significant acquisitions because it sees a huge opportunity internally." Take out the word "opportunity" and replace it with the word "problem" and everything fits nicely.